Friends of the Program but do not have a student directly involved. Their name will be listed in the playbills. Connect your Amazon account to shop through Amazon Smile and we receive a percentage of your purchases. Dine-out at restaurants during certain promotional periods and our program receives a percentages of proceeds. Click on the restaurant name to download the flyer! Ads are available in the Newsies playbill. Contact Mrs. M to purchase a Shout-out to a cast/crew member ($3) for A Christmas Carol and Newsies. Connect your Kroger Rewards card to WN Theatre and we receive a percentage of your purchases. In 2017-2018, the district replaced the stage curtain. Order a piece of Theatre history. The curtain piece comes framed and is available in 2 sizes. Send the legendary golden flock of flamingos to a yard near you. Celebrate birthdays or other special occasions. Send the to a cast or crew member in the show. Send them just to be funny. Program listing your sponsorship in the playbills. Company name and logo on a plaque in the hallway outside the entrance to the theatre. Announced at the beginning of each show. 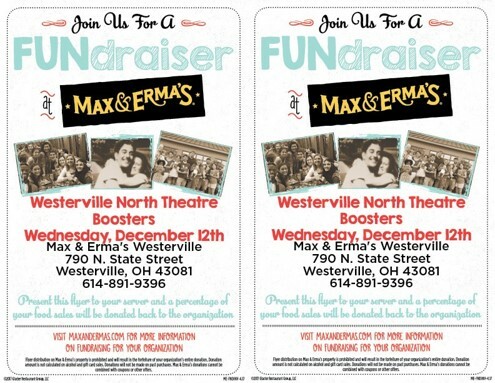 Company logo on the Westerville North Theatre Boosters website.